White-ball cricket is fast food; red-ball cricket is fine dining. This immutable cliché is hard to dispute, yet there is one almighty exception which proves ODIs can also be haute cricket. The 1999 World Cup semi-final between Australia and South Africa was Ferran Adria's take on the Big Mac. It was a Test match in all but name, with the same subtlety, tempo variations and depth. It wasn't just stranger than fiction; it was more complex, more profound - and it had a twist so savage that even Hitchcock might have deemed it too callous. Two decades later, it's still hard to comprehend that a limited-overs match - any match - could produce such intensity. Towards the end, even Shane Warne, who lived for such moments, thought that he had never known such tension on a cricket field. Warne was part of an ensemble cast to die for. There were present and future greats on both sides, from Allan Donald and the Waugh brothers in their 30s to Ricky Ponting and Jacques Kallis in their early 20s. Between them, the two XIs would end their ODI careers with 4584 caps, 106,188 runs and 2630 wickets. None would experience anything to compare with a match that was career-defining for many of the losers, never mind the winners. The story of the 1999 World Cup semi-final begins on February 1, 1994. That was when Warne bowled Australia to victory in the third and final Test in Adelaide, and denied South Africa a famous series win. For the next five years, in both forms of the game, they were routinely thwarted in pressure situations by Australia - and particularly by Warne and Steve Waugh. South Africa beat Australia in the first final of the triangular ODI tournament in 1993-94 and 1997-98, only to lose 1-2 each time. In 1997-98, they beat Australia in all four group games as well. Wisden said South Africa were "without doubt, the best team of the one-day summer". But it was Australia who won. It was during that triangular tournament that Waugh, Australia's new one-day captain, reportedly said that South Africa "had a tendency to choke under pressure". 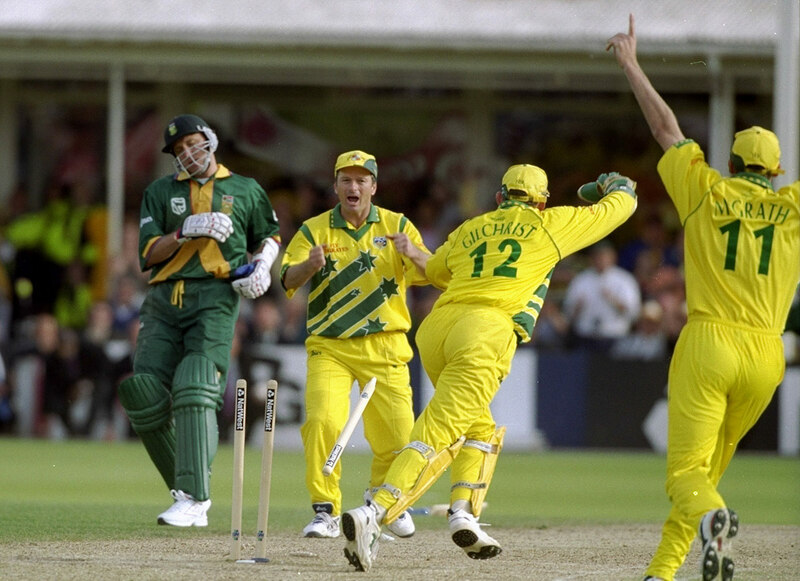 South Africa did beat an almost full-strength Australia in the gold-medal match at the 1998 Commonwealth Games, though that was their only victory over the Aussies in a final since their readmission to international cricket in 1991. Bob Woolmer, their coach, thought it had broken the psychological hold Australia had on his team. 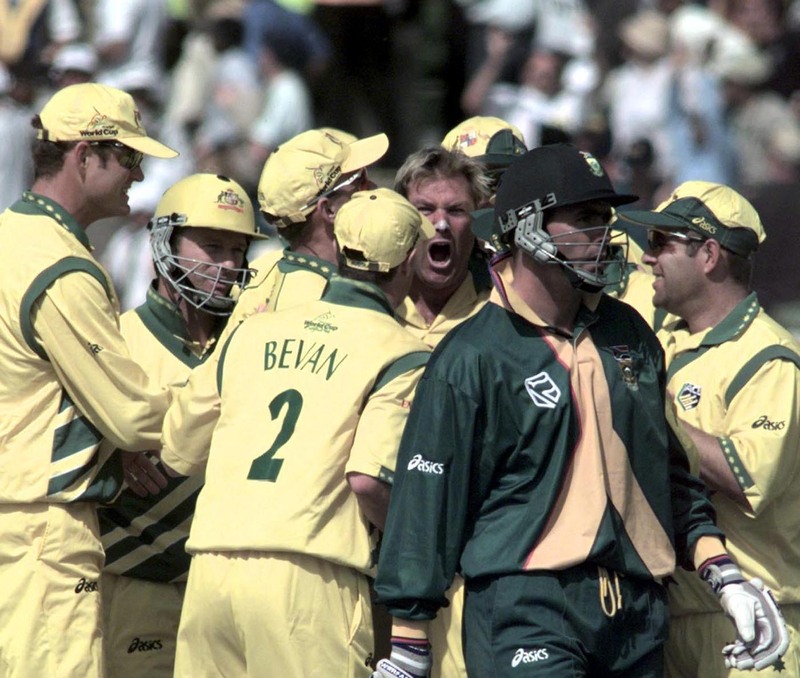 Woolmer's view was not widely shared, and Australia's record against South Africa dominated the spiteful trash talk that preceded the semi-final in 1999. South Africa had missed a chance to eliminate Australia at Headingley four days earlier. They had already qualified for the semis, having powered through the tournament with ominous authority, but a win in their final Super Six game would have seen off Australia and probably ended the one-day careers of their chief nemeses Warne and Waugh. Instead, Waugh played an astonishing innings of 120 not out from 110 balls. When he reached 50, some South African players goaded him about his poor ODI conversion rate: one century and 36 fifties. Waugh converted their barbs into motivation. Herschelle Gibbs' infamous drop at midwicket sometimes overshadows the quality and audacity of Waugh's innings. There was a brutal certainty to his strokeplay, and by the end he was even slog-sweeping fast bowlers. For a couple of hours, he played like somebody else. When he was interviewed before the semi-final, Waugh cleverly managed to effectively call South Africa chokers while also denying ever having done so. "I never said South Africa were chokers," he said. "I said they couldn't play well under pressure. But if remarks like that upset them, then they have problems." They certainly upset Woolmer, who was not in the best humour when journalists kept asking him about the C-word before the semi-final. "When you call us chokers you have to go back pre-1997," Woolmer said. "This is 1999, the choking thing is all played out. Why should we be called chokers when we have an 80% win record? You only have to look at the facts." The facts were that in the last four years, South Africa had won 76 and lost 20 of their completed ODIs. The facts were also that seven of those defeats had come in 18 matches against Australia. There was enough in the Edgbaston pitch for South Africa to bowl first when they won the toss, a decision that was instantly validated. Mark Waugh went for a duck in the first over, unable to avoid a homing short ball from Shaun Pollock. Thereafter South Africa were never really behind in the game; Steve Waugh reckoned that Australia were decisively on top for only one ball in the entire match. After a slow start, Ponting's coruscating strokeplay, including pulls for six and four off consecutive deliveries from Steve Elworthy, got Australia moving. "Sky continually run the game in the office here," says Elworthy, who is the tournament director of the 2019 World Cup. "I'm continually reminded of it by the Australians working in the organisation. 'Elworthy, you're about to go for six here!'" Australia lost their way after Ponting's starburst, shedding three wickets in four overs. Ponting and Darren Lehmann fell in the first over bowled by Donald, who then caught Adam Gilchrist at third man off Kallis. Steve Waugh also survived a run-out chance when Gary Kirsten's throw flashed past the stumps. From 68 for 4, and with Tom Moody the only batsman to come, Waugh and Michael Bevan had little option but to consolidate. They took a time-out while the innings was still going on. At the start Australia had wanted 250, but they revised that to 220 after the loss of early wickets. Bevan was peerless at chasing targets; he was pretty good at working them out as well. "I work on the theory," he said in The Best of Bevan, "that sometimes you have to do less than what your conscience is nagging you to do." After a couple of early boundaries Bevan and Waugh scored only six runs in 8.4 overs. It was nerveless conceit from two players who should have been tested after the match to see whether they exceeded the legal amount of ice in their veins. At that stage Waugh had 16 from 46 balls and Bevan 8 from 40. Once you promise, you have to pay - and so they did, with Waugh scoring 40 from his last 30 deliveries and Bevan 57 from his last 61. Watch Klusener, Fleming and Kallis talk about the "best ODI of all time"
Bevan, the greatest finisher of his generation, played umpteen match-winning knocks in his career. His 65 at Edgbaston is almost forgotten because of what came later, even though it was the highest score of the match; yet he was at ease throughout his innings and said he rarely felt as comfortable during a big game. The same was not true of Waugh. Four days earlier he larruped that immense century to beat South Africa on an up-and-down pitch, and felt in the zone throughout the innings. Lehmann had never seen Waugh as excited as he was when he returned to the dressing room. Yet at Edgbaston he felt mentally fatigued and had to constantly nag himself to snap out of it. Waugh's 56 dominated a restorative stand of 90 before he fell to Pollock, who then dismissed Moody for a duck in the same over. Australia were back in trouble at 158 for 6, but a level-headed partnership of 49 between Bevan and Warne took them past 200. Donald and Pollock, sharing nine wickets, wrapped things up. Australia had 213 - a total that, though below par, gave them something to work with. That's all Warne ever asked for. The pitch had done a bit for the seamers during Australia's innings. During the break, the sun came out and things changed. In the first ten overs of South Africa's innings the ball hardly moved off the straight, and Gibbs struck six boundaries of ever-increasing beauty. Gibbs, said Warne in his first autobiography, batted "like a man on a mission to redeem his soul" after dropping Waugh in the Super Six match. It was an incident Warne had foreseen. The night before that match, as the Australian team meeting was finishing, Warne said anyone caught by Gibbs should hang around because he was liable to throw the ball away prematurely and the umpires might rule it not out. Warne's observation could barely have received more ridicule had he told his team-mates he was going on a date with Liz Hurley. The next day, when it came to pass, he giddily shouted "I told you! I told you!" to anyone and everyone. That moment was one of the few highlights of Warne's World Cup. He'd endured a miserable few months, which started when he was left out of the final Test in the West Indies, and was still getting used to bowling with a reconstructed shoulder. The Australian team had not been home for months and many of them were on edge, particularly Warne and Steve Waugh, the captain. Waugh figured he would lose his job, and never play one-day cricket again, if Australia failed to make at least the semi-finals. He and his brother Mark also found out during the tournament that their grandfather Edward was dying of cancer, and Steve felt guilty because his pregnant wife was suffering with severe morning sickness. "I can't tell you," he wrote in No Regrets, his World Cup diary, "how much I'm missing home." Warne missed the birth of his second child, Jackson, the night before the group game against New Zealand. He could not get to sleep and said the next day's game was one of the few in his career when he was not focused. There were also whispers of imminent match-fixing allegations, a fine from the ICC for criticising Arjuna Ranatunga, and incessant, often gratuitous press interest. In Australia's tournament opener he playfully gave the bird to Scotland fans and found it used out of context the next day. Australia started the tournament poorly, losing to New Zealand and Pakistan during the first group stage. Things started to improve when they changed the team by bringing in Moody and Paul Reiffel for Shane Lee and Adam Dale. 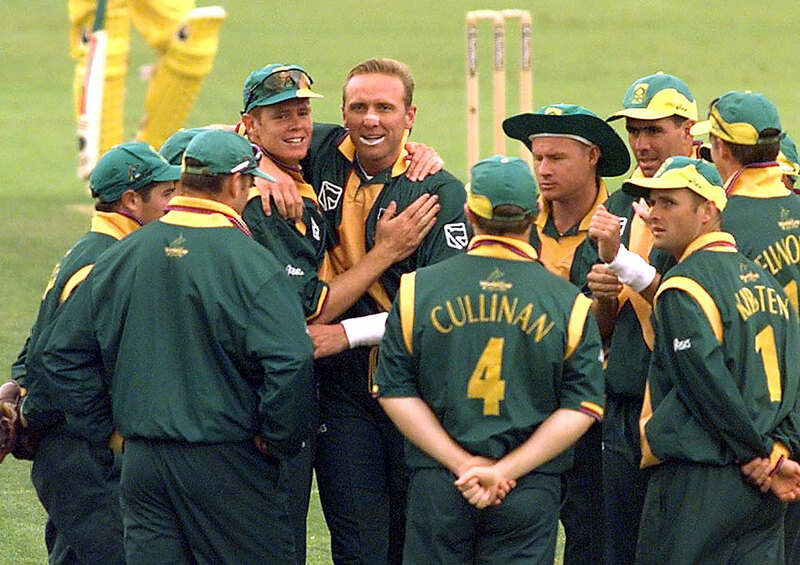 Australia had openly copied South Africa's use of Donald by having Glenn McGrath at first change, but Dale struggled to swing the new ball and the tactic was scrapped. Moody was a vital confidante to Waugh and a conduit to the rest of the team. He told Waugh and the coach Geoff Marsh that the players were unhappy with curfews and a drinking ban, both of which Waugh relaxed as a result. A number of the players attribute that, and the two changes to the starting XI, as the turning points of Australia's campaign. They were not exactly painting the town green and gold but a few quiet beers restored a weakening team spirit. Waugh found inspiration anywhere he could. When Shoaib Akhtar slyly kicked him during the group game against Pakistan, Waugh felt that warm, familiar feeling of competitive fury and told him that every dog has its day. Pakistan won the game but Australia were starting to rage against the dying of the light. Waugh was alone in a hotel room in Durham with a Coke and a club sandwich when Manchester United, having been outplayed, scored two injury-time goals to win the Champions League final against Bayern Munich - and, with it, an unprecedented treble. "As I watched this stunning fightback I couldn't help thinking that anything is possible in sport and in life, if you want it badly enough and have enough faith in those around you," he wrote in No Regrets. "What we have to do in the World Cup suddenly seems quite simple - go out there, give it a 'red hot go', and trust ourselves." 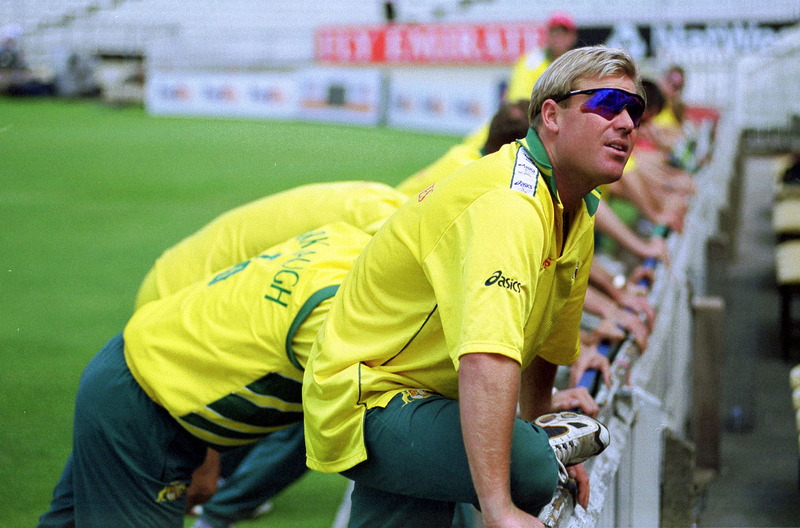 Playing against South Africa helped Warne rediscover himself. In the Super Six stage he was taken apart by India's Ajay Jadeja and Robin Singh and then Zimbabwe's Neil Johnson. Australia won both games but that was only partial consolation to Warne. "Psychologically," according to Waugh, "he was at an all-time low." That improved a little after the Super Six win over South Africa, where he bowled beautifully, but he was still unusually vulnerable going into the semi-final. During the innings break at Edgbaston, Warne told his team-mates that if they lost, some of them would never play for Australia again. In case anyone hadn't been paying attention, he said it a second time. "I'd had a hunch for a week or two that, when we got knocked out of the Cup, Shane was going to follow through on his previous mumblings about retirement," said Ponting in At the Close of Play. "And I wasn't the only one thinking this." When Waugh dropped Warne in the Caribbean, a decision that would ultimately destroy their relationship, Warne pleaded his case by citing his big-game record. It fell on deaf ears, but Waugh needed it like never before at Edgbaston. Warne was a man who barely acknowledged the concept of defeat, never mind that it might happen to an Australian team of which he was part. "I thought that if this was going to be my last chance to win the World Cup," he decided, "I was going to give it a red-hot dip." Waugh turned to Warne earlier than planned, with South Africa 43 for none after ten overs. The second ball of Warne's second over drifted outside Gibbs' leg stump before ripping across him to trim the off bail. It was a flawless bit of self-plagiarism, an identical delivery to the one that changed his life when he bowled Mike Gatting in 1993. Even the reaction of the batsman was the same. Like Gatting, Gibbs could not comprehend that he had been bowled. He didn't hear the bails come off, so when Gilchrist started shouting in celebration he thought, "What the hell's he going on about?" As Gibbs was processing what had happened, Warne launched a furious celebration, repeatedly screaming "Come on!" to everyone and no one. At a stroke, he stopped worrying about everything - his shoulder, his confidence, his life and, most importantly, the past and the future. Warne was a master of sporting mindfulness. When he was at his best, all that mattered was this moment, and this next ball. For others that was not so easy, and the dismissal of Gibbs, bowled neck and crop, was resounding in more ways than one. It made South Africa wonder whether there was still life in the old bogeyman; because while they had crushed Australia in that Commonwealth Games gold-medal match, Warne had not been playing there. They had got on top of Warne at times, but they never had the final word. The wicket also gave the Australian players strength at a time when some were starting to think they had used up all their lives in the tournament. Warne had told them about Gibbs' catching a few days earlier and was proved right; now he was telling them this game was winnable. There was a comforting precedent, too: eight of the XI took part in the 1996 World Cup semi-final against West Indies, when Australia came back from an even worse position to win. "As I was fielding nearby I was the first to be hit with the pent-up force that he'd suppressed in his system," said Steve Waugh in Out of My Comfort Zone. "He was so fired up and animated that it took a wall of players to stifle his forward thrust. His drive and will were literally scary, but he sparked life into others who were tensing up under the South African onslaught and got us back into the game." The next batsman was Daryll Cullinan, Warne's bunny. When he defended his first ball back down the pitch, Warne sprinted to collect and fling it gratuitously towards his head. Cullinan ducked and Warne turned on his heels, looking conspiratorially at one of his team-mates as he walked back to his mark. Warne was taught by Allan Border about the value of picking a fight if he needed to get himself going. He was already in the mood, but there was no harm in going to another gear. It was, just as importantly, another way of informing South Africa that the game was now being played exclusively on Warne's terms. His second over, which included the wicket of Gibbs, was a wicket maiden. Expert poker player that Warne is, he saw that and raised it with a double-wicket maiden in his third over. Gary Kirsten, the calmest, most logical of batsmen, launched into a hideous slog-sweep and was bowled. Warne repeated his celebration but took it up a notch, screaming "Come on!" in every direction and whirring his arms as if he was conducting his own elemental force. He was so pumped up at the start of his spell that he had to take extravagant deep breaths so he could concentrate. Everyone was mesmerised by Warne - even the umpire David Shepherd, who gave Hansie Cronje out caught at slip off the boot for a duck. This time Warne's reaction was different, an orthodox celebration that suggested the mood of the match had already changed. Warne bowled four maidens in five overs, and his first spell of 8-4-12-3 dragged a hitherto comfortable South Africa into a desperate fight for survival. Cullinan fell for a 30-ball 6, run out by Bevan after taking an age to respond to Kallis' call. South Africa had slipped from 48 for nought to 61 for 4 in nine traumatic overs. Kallis, who played despite a stomach strain and had already bowled ten overs for 27, regrouped with Jonty Rhodes, just as Waugh and Bevan had done earlier in the day. They took their time, mainly so that they could see off Warne, and there were no boundaries for 17 overs. It was as if Warne's hold was so great that they daren't attack at either end while he was bowling. The required run rate, which nobody thought would be an issue when South Africa started their innings, moved above a run a ball in the 28th over. Rhodes stole a number of singles, and as the innings progressed, every run or dot ball felt more precious - not just because of the stakes but also the relatively low-scoring nature of the match. "For every single ball of that innings," said Waugh, "I was aware that one wrong field placing or a poorly timed bowling change could cost us the game." Some bowling changes were unavoidable. The introduction of the fifth bowlers, Moody and Mark Waugh, allowed Kallis and Rhodes to steadily increase the pace. When Rhodes hoicked Waugh for six in the 40th over, South Africa had a semblance of control. They needed 70 off the last ten overs, with Kallis and Rhodes well set and some formidable hitters to come. But in this game, the box seat was often an ejector seat. "On the boundary," said Bevan, "I remember thinking, 'We're going to win this. No, we're going to lose this. No, we're going to win this.' Every over." Bevan charged in from that boundary to take a superb running catch when Rhodes pulled Reiffel towards deep square leg, and the mood of the match changed yet again. South Africa used Pollock rather than Lance Klusener, the player of the tournament to that point, at No. 7. They had been flexible throughout, with Klusener batting in five different positions, yet hindsight suggests it was a dreadful error to hold him back when the match was already into the final ten overs. He had an astonishing World Cup, muscling boundaries at will with his huge bat and finishing with an average of 140.50 and a strike rate of 122.17. Warne had two overs remaining, and South Africa may have been worried about him getting Klusener before Klusener could get Australia. Rhodes' wicket led to another change of tempo, with a sedate 16 from the next three and a half overs. Then came the 45th over, Warne's last, which started with South Africa needing 53 from 36 balls. There was no longer any time to see him off. Kallis was dropped off the first ball, an awkward sliding chance to Reiffel running in from long-on; then Pollock hammered the next two balls for six and four, the only boundaries off Warne all day. Warne, who had conceded 14 from his first nine overs, went for 14 from the first four balls of his tenth. With Kallis on strike, Warne implored himself to slow down, make the batsman wait, drag the moment out. He slowed the ball down, too, and Kallis, beaten in the flight, lobbed to Steve Waugh at extra cover. This time, Warne did not even celebrate; as the match crescendoed, so his reaction to wickets went in the opposite direction. 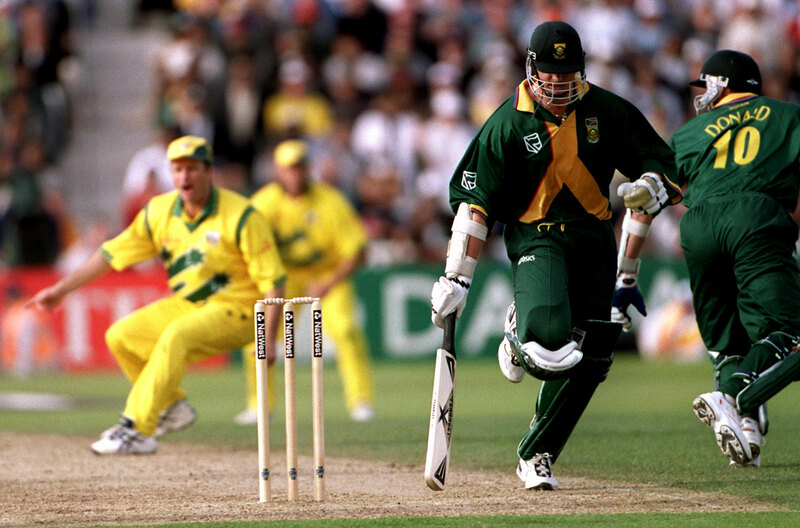 South Africa couldn't hold Klusener back any longer, and he took a single off the only ball he faced from Warne. If there is one regret for neutrals from this match, it's that the two biggest auras in the tournament did not collide for longer. Klusener thumped Damien Fleming for four off the second ball of his innings to signal another change of mood and momentum. Later in the over Pollock dragged a yorker back onto the stumps to end a cameo of 20 from 14 balls, before whacking his bat into the ground. Klusener was the embodiment of one of Woolmer's favourite sayings, which he picked up from the British Lions coach Ian McGeechan: "Brains in the fridge, bodies in the oven." As the match reached its climax, the tension became too much for everyone. Even the wives and girlfriends of the players had a run-in in the viewing area, when the Australians took exception to South Africa's perceived triumphalism. In the South Africa dressing room, the squad member Nicky Boje sought sanctuary in the physio room to watch the game on TV. Gibbs couldn't even bear to do that; he watched the game on Boje's face. Donald, meanwhile, had long since taken refuge in a private room, watching 30 overs on TV with the fourth umpire, Roy Palmer, all the while praying he wouldn't have to bat. The new batsman was Mark Boucher, the youngest player in the match at 22. Any young kid dreams of playing for his country in a World Cup semi-final. But this level of suffocating pressure is not in the brochure. It was too much for Boucher, who struggled to get Klusener on strike and used up precious deliveries. His tortuous innings of five from ten balls ended when he was cleaned up by McGrath, at which point South Africa needed 18 from ten. The new batsman, the No. 10, Steve Elworthy, had a solitary thought. "Get Klusener on strike. That's all I was thinking. Get him on strike and let him get us home because he'd had such an amazing tournament. "God, I remember him hitting Shoaib Akhtar into the Radcliffe Road Stand at Trent Bridge - Shoaib was bowling nearly 100mph and he was pulling him in front of square for six." When Elworthy came out, Klusener had faced only five of the previous 16 deliveries. South Africa had a tank, yet they were using their pea-shooter. Elworthy got him on strike and then sacrificed himself at the non-striker's end, coming back for a tight second to long-on. Reiffel's superb throw hit McGrath's hand and deflected onto the stumps. It was a key moment, not least because the third umpire, Steve Bucknor, took over two minutes before giving the decision. There were inconclusive replays from multiple angles until one showed McGrath had not broken the stumps himself. Donald, the last man, walked to the non-striker's end and smiled awkwardly at the umpire, Shepherd. "I've never been so nervous in my life," Donald said later. "It was like flying with one wheel off, waiting for the crash landing." South Africa needed 16 off eight balls with one wicket remaining. In his World Cup diary, Waugh reckoned this was the only time in the whole match that Australia had their noses in front. The next ball was a low full toss from McGrath, which Klusener heaved towards long-on. Reiffel instinctively took a step forward, then realised the ball was hurtling towards him with the force of a rising tide. He back-pedalled and palmed it over the boundary for six. Everyone had lost their head. The commentary of Bill Lawry and Mike Procter conveys the sheer mania of those last ten minutes. As Klusener hit that ball towards long-on, Lawry started having a conversation with himself: "Full pitch, down to Reiffel, he should catch this, should he? No, he drops it!" Later in the over, in a delicious Freudian slip, Lawry said, "It's all happening, and what a final." Seconds later, Procter said the teams were competing to face Pakistan "in the semi-final on Sunday". This is not to criticise two fine commentators - quite the contrary. Their infectious commentary demonstrates a level of tension and excitement that was unprecedented. Klusener took a comfortable single off the last ball of the 49th over, which left him needing nine from the final over to win the match. McGrath, fearing the consequences of Klusener retaining the strike, gruffly accepted his cap and mouthed a popular four-letter word under his breath. It was now that the possibility of a tie started to dawn on everyone. The commentators explained that South Africa needed to win the game, though they didn't say why. Most of the players on both sides didn't even know what would happen if there was a tie. A little bit of small print in the playing conditions - article 11.4 - determined that if there was a tie in the semi-final, the winner would be the team that finished higher in the Super Six stage. That was Australia, because of their win over South Africa four days earlier. Had there been a tie in the final, the World Cup would have been shared. None of this was an essential point of discussion at the team meeting: there had never been a tie in a World Cup match before. Damien Fleming had bowled the final over against West Indies in the 1996 semi-final. This time he had to bowl at Klusener, the most intimidating batsman in the world at that time. Australia had been told that 80% of his runs came on the leg side, so Fleming was advised to bowl wide yorkers outside off stump from around the wicket. He wasn't particularly comfortable with the idea - especially as it had only been decided the night before, meaning he had no chance to practise - but went along with it. There were five men back, with the aim of giving away a single. The first yorker, said Fleming, was "perfect, exactly where I wanted it go", yet Klusener battered it through the covers with chilling force. As the ball left the bat, Moody, fielding at deep cover, calculated that he might be able to stop the second run. His legs had barely started moving when the ball thumped off the boundary boards. "I don't think I'd ever seen a ball hit harder," said Donald in White Lightning. "Until the next delivery." Amid the shrieking of the supporters, Klusener's face was a picture of calm. He was just seeing the ball and hitting it, like he had all tournament. "I'm still in awe at his calmness," said Donald, "as I think of the bedlam out in the middle, and the stakes that we were playing for." Before the next ball, Klusener asked Shepherd what South Africa's target was. Shepherd said Klusener did not ask specifically whether or why a tie would put Australia through, though everything that happened subsequently suggests he had got the message that it would not be enough for South Africa. He was the embodiment of one of Woolmer's favourite sayings, which he picked up from the British Lions coach Ian McGeechan: "Brains in the fridge, bodies in the oven." The next ball was another attempted yorker, and this time Klusener slaughtered it through wide mid-off for four more. The consensus from those on the ground is that those two shots from Klusener must be among the hardest hits in cricket history. He had 31 from 14 balls, the scores were level, and Australia looked beaten. Waugh slowed things down for a while and brought the field up, but it was a token gesture. During the post-match press conference, somebody told Waugh that he seemed calm. "Jeez, is that what it looked like?" Waugh replied. "Actually, we were shitting ourselves." The South Africa dressing room was a mess of emotions. Gibbs stood with a bottle of champagne in his hand, waiting to pop it and redeem his soul. Some whooped and hollered, prompting Woolmer to plead for everyone to calm down; others sat quietly. Elworthy still had his pads on, Cronje had his hands together in prayer. Cullinan wondered internally whether somebody should run out on the field with a new pair of gloves to slow things down. It is surely in that little window of time that Klusener realised what he was about to achieve. Had South Africa needed two or three runs, he would probably have smashed another boundary. But you can beg, steal or borrow a single run. Before the game, Fleming had chatted to the journalist Andrew Ramsey, who asked him about Klusener. Fleming spoke about the importance of having a plan B to such a devastating player. The wide yorkers from around the wicket had not worked, so he decided to switch back over, where he was more comfortable. Fleming told Waugh, who offered a resigned assent. The next ball, an intended yorker, ended up as a half-tracker. Klusener, who was probably as surprised as Fleming at the length of the delivery, pulled it towards Lehmann at mid-on. Donald, instinctively backing up a long way, was well short of his crease when Lehmann's throw missed the stumps by centimetres. As all the Australian players put their hands on their heads in unison, Donald, his heart a drum-and-bass track, looked up with the guilty smile of a man who had avoided a firing squad on a technicality. At this point even Warne, the man who never gave up, gave up. In football, those who analyse penalty shoot-outs have found that players who do not rush their kick, who take an extra second or two to compose themselves and take control of the situation, are much more likely to score. It seems extraordinary with hindsight that neither side took time out of the game before the next ball, the fourth of the over and the last of the match. It was as if they could take no more, and needed the relief of it being over one way or another. There were 91 seconds between the second and third balls of the over, but only 36 between the third and the fourth. Fleming got his yorker spot on, just outside off stump as intended. Klusener miscued it down the ground and set off almost before the ball had hit the bat. Donald saw Klusener move but then, spooked by his escape the previous ball, turned around to back up. By the time he tried to run, his brain and body had stopped communicating. "I looked up at Lance, saw him rushing to my end, and so I started to run as well," he said in White Lightning. "My legs felt like jelly, as if I wasn't making any headway at all down to the other end. I tried to get my legs moving properly. It was a dreamlike sequence, almost in slow motion." As time slowed down, all Donald could hear were Australian voices screaming, "Keeper's end!" He eventually tried to turn and run, but dropped his bat in the process and was paralysed for a split second as he looked down and tried to decide whether to pick it up. Mark Waugh, insouciant to the last, collected the ball on the run and flicked it out of the side of the hand towards the stumps at the non-striker's end. A direct hit would have run out either Donald or Klusener, who were both short of their ground; instead the ball went past the stumps to Fleming, who had been so transfixed that he didn't back up properly. By the time the ball reached him, Klusener was home, so he turned and underarmed the ball with the utmost care to the keeper, Gilchrist. Klusener kept running, straight off the field, taking only a cursory look over his shoulder to confirm what he already knew. Donald stood in the middle of the pitch, the loneliest anyone has ever been on a cricket field. The saddest sight of the game was Donald's pitiful, belated attempt to run to the other end, without his bat, knowing deep down that every step was futile. Two things demonstrate that a sporting contest has moved beyond greatness. The first is that, when you watch the video - even 20 years later, even when you know exactly what is going happen, even when you're a neutral - you still feel nervous. The second is that, at the moment of triumph, those on the winning side lose control of their limbs. "I just ran to the bloke nearest me, can't remember who it was, and screamed in delight," said Bevan. "The euphoria was one of the best feelings I have ever had in my life." Gilchrist, having broken the stumps at one end, then ran straight down the other end to collect a souvenir. He had no idea why. The primal roar of the Australian players remains vivid in the mind's ear. Many of them have described it as the greatest moment of their careers - yet some didn't know precisely what they were cheering. Warne certainly knew a tie was enough for Australia, but most were simply celebrating the fact they had avoided defeat. They didn't know or care whether there would be a bowl-out, a toss of the coin, whether they would have to come back and do the whole thing again the following day. They had avoided defeat. Within seconds, whether because of verbal confirmation or just through body language, everybody realised they were in the World Cup final. 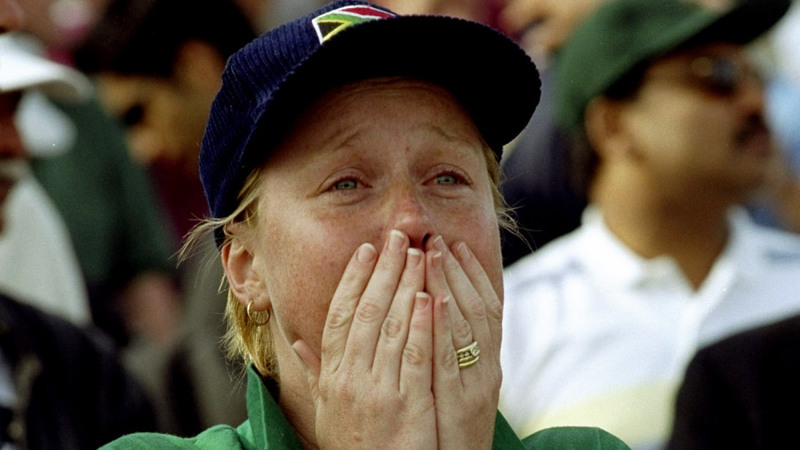 It was Australia's triumph, yet in many ways the game belongs to South Africa, who were instantly plunged into the kind of sporting grief that few will ever know. "The scene in our dressing-room resembled that of a refuge in the midst of a natural disaster," wrote Woolmer in Woolmer on Cricket. "Of course, this disaster did not suffer any human tragedy, but by cricketing standards it measured 10.6 on the Richter scale." Donald walked straight into the physio's room with his pads still on, locked the door and cried for half an hour. Most of the others put towels over their heads to create a private space where they could let it all out. "I saw some big men cry in the dressing room that night," said the team manager, Goolam Rajah. "It was very sad." "I will never forget the looks on people's faces," says Elworthy. "It's hair-on-the-back-of-your-neck stuff. Everybody was staring into the abyss. And to hear the celebrations next door was just horrible. After what felt like about 45 minutes - it could have been ten minutes, it could have been two hours, I don't know - Hansie and Bob pulled us together in a team huddle in the middle of the changing room." After speeches from Woolmer and Cronje, the team dispersed. When they left the ground, one South African fan shouted, "Why didn't you f*****g run, Donald?" Donald drove to his Warwickshire home, where his pain was temporarily soothed by two young children smiling with joy at the sight of their daddy. Woolmer wanted to go to dinner and chat with Cronje; he was with his wife, so Woolmer shared a bottle of champagne with some old friends and tried to make sense of it all. Many South African players can't remember the bus ride back to the hotel or what they did that night. "We had been on an emotional rollercoaster throughout the tournament and it was gone, it was all gone, as quick as that," says Elworthy. "That's the brutality of a tournament like this - one moment you're on the brink of the final day, the next day you're on a plane." Some went home; others went to Europe. 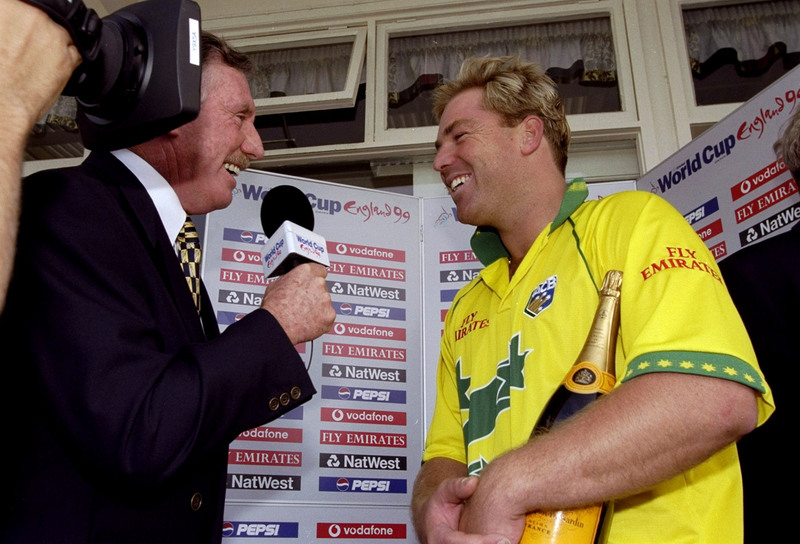 A handful stayed in London - including Klusener, who had to collect his Player of the Tournament award - and were at the same hotel when Australia returned three days later after hammering Pakistan in the final. Even the victors were numb after the semi-final. There was initial euphoria - Steve Waugh became physically aware of the blood and adrenaline racing round his system, and the whole team gathered round to watch a replay of the final over, cheering almost as loudly the second time as they had the first. But the match was so mentally draining that the celebrations became increasingly subdued. There was nothing like the delirium of the victory in the Super Six at Headingley, when the coach, Geoff Marsh, rode his chair like a jockey in celebration and some of the players drank till dawn. The final was only 63 hours away, and they did not want a repeat of the 1996 tournament when they had won an amazing semi-final against West Indies only to lose heavily to Sri Lanka four days later. After the game Warne called his wife, Simone, who had stayed up until the small hours to watch the game with her family, and then went for a drink with his Victoria team-mate Darren Berry. Steve Waugh found Birmingham too crowded to celebrate as he wished, and had one drink before going back to his hotel room to write his diary. The muted celebrations in the dressing room also, perhaps, demonstrated sympathy for South Africa's suffering. The teams did not always like each other, and though Waugh reached peak Steve Waugh with his post-match comment - "I almost feel sorry for South Africa" - there was a lot of mutual respect. Waugh was also very generous about opponents who had pushed him to places he didn't know existed. "Those guys can walk away with their heads held high, they did their country proud." He and Warne commiserated with Cronje during the prize-giving. "It was quite chilling," said Warne, "to see a man so shell-shocked that he kept opening his mouth without words coming out." McGrath and Donald swapped shirts and shared emotions. The teams were like fighters embracing after the final bell, tacitly acknowledging that they had been through things most human beings could not understand. It was an unimprovable game, the kind in which - as the cliché goes - there doesn't deserve to be a winner or a loser. Wisden will always say "Match Tied". In the 2000 Almanack, the editor, Matthew Engel, described the ruling that eliminated South Africa as a "vile technicality". In a sense, they had lost it 19 days earlier. A seemingly throwaway defeat to Zimbabwe in the first group stage ultimately came back to haunt them. Had they beaten Zimbabwe, they would have finished above Australia in the Super Six stage, and a tie would have put them through. The match, fairly or not, cemented South Africa's self-perpetuating reputation as chokers. Yet the players on both sides made the point that, towards the end, they cracked at different times. The miracle is that they could still do so many things right, especially Fleming and Klusener. "Australia choked far more than we did in the closing overs, but the one moment of indecision cost us the game," said Boucher in his autobiography, Bouch: Through My Eyes. "They dropped a catch, bowled a no-ball that wasn't called, missed an easy run out two balls before the end… But that's the way it was." In a parallel universe, the fall guy might have been Reiffel, for dropping those catches, or Lehmann, for missing the run-out chance; or even Warne, for going for 15 in his last over. "The whole game could have hinged on that Klusener catch," said Reiffel before the final. "I went through a lot on Thursday." Everyone was a hero, everyone was a villain. Every little moment mattered, from Kirsten just missing a run-out early in Waugh's innings to Bevan, ever the anonymous match-winner, brilliantly saving a fourth run when Rhodes late cut Mark Waugh in the 36th over. There was also at least one uncalled no-ball during South Africa's innings. "It was THE game," said Woolmer. "It could have gone either way. History could have gone either way. Reminds me of a great film called Sliding Doors." That last sliding door is all anybody really remembers. "I am upset with myself that I had done all the hard work and then I didn't do the easy part. That's the regret," said Klusener in a recent interview to the Cricket Monthly. "I was there to finish it - that was my job - but where were the batters? It wasn't a big score that we were chasing, and we were well placed. Why did I have to bat with Al [Donald]? It is not Al's job. Where was Herschelle, where was Gary, where was Jonty, where was Daryll, where was Hansie? Watching? Why?" In the dressing room, when their throats finally allowed them to speak, Klusener and Donald played a game of one-downmanship, each trying to absolve the other of responsibility. There are things both might have done differently, but the only people who blame them are those who haven't experienced a hundredth of the pressure they were under. If they had their time again, they would doubtless do things differently. Klusener would not take such a risky run. But once he had decided to go, Donald would set off instantly rather than being mesmerised by the ball. At the time, however, he could not hear Klusener's call because of the noise of the crowd. Donald eventually turned to run without seeing Klusener hurtling towards him, presumably interpreting from the urgency of Mark Waugh's movements that his partner was attempting a run. His mind was so scrambled that he could have been run out at either end. Klusener had been eerily calm, all the way up the last delivery. Then it became too much. His brain was in the oven and Donald's body was frozen. South Africa were an ODI machine - but they were a machine with blood, with a brain, with anima. And that, given a combination of their uptight nature, a burgeoning fatalism about the World Cup, and an asphyxiating inferiority complex against Australia, meant they malfunctioned for one devastating moment. "A single, solitary run for a place in the World Cup final," wrote Waugh in No Regrets. "A place where South Africa had never been before. And that, almost certainly, was the problem… The South Africans were good, but against us, well, we felt they just wanted it too badly." They still do. 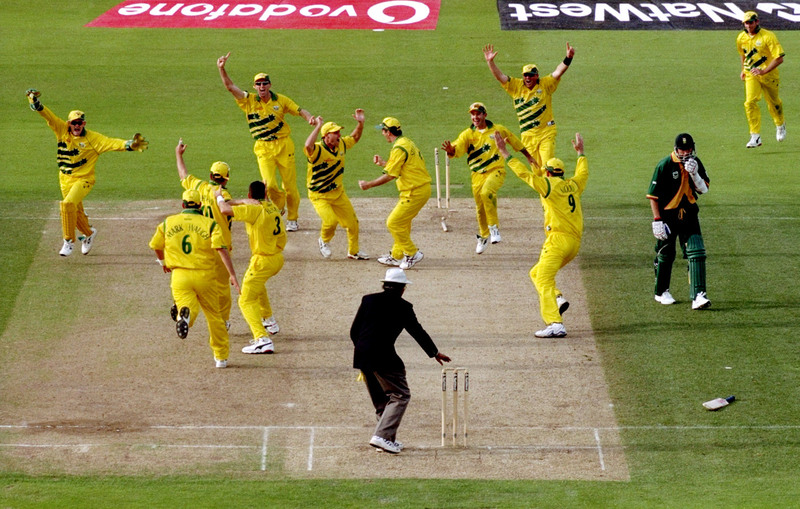 There has been no closure in the World Cup, and until South Africa win it, the 1999 semi-final will always be a story without an ending. Gibbs, Kallis and Boucher had a form of catharsis seven years later when South Africa chased a target of 435 to beat Australia in a legendary series decider. Gibbs scored 175 of those runs all on his own. Yet the most noteworthy thing about his career is the moment he dropped the World Cup. It is also viciously cruel that this moment - an innings of 0 off 0 balls - has come to define the career of a fast-bowling champion. "I don't think that disappointment comes in bigger packages than that," said Donald in an interview to the Guardian. "It was the most disgusting thing that could happen." Unsurprisingly, he confronted it head on. He made himself watch the video again and again and again as a way of dealing with it, describing it as a form of therapy. But it was still there, and later that summer Warwickshire gave him a fortnight off because he was so weary. He says it took him "at least" four months to get it out of his system. Everyone dealt with it in different ways. Cullinan went to Bermuda to coach for four months. Cronje barely slept for a fortnight; Woolmer had nightmares for months. Klusener felt less inclined to watch the video, though he cannot escape it. "It's always on somewhere, so I have seen it numerous times," he said. "No, it doesn't bother me. I know what happens. I have seen the movie before. I made the movie." The movie with the most haunting ending in cricket history. Both Cronje and Woolmer, you suspect, took it to the grave when they died in shocking circumstances in 2002 and 2007. It was Woolmer's last game as South Africa coach. Few sides, if any, have played such brilliant one-day cricket for such a sustained period. In his five years in charge, the team had a win-ratio of almost 3:1, more than double that of Australia in second place. "It hurt not because I wanted to win the World Cup more than anything else, but because we were comfortably the best-equipped team in the competition," he said. "Our tactics and our build-up had been as good as anyone could have wished for, and there were millions of people who thought we would go all the way." For five years he had preached the importance of details in one-day cricket, particularly fielding and running between the wickets. He even introduced a motto to the team: "One run can make the difference."